WOOOO HOOO KATHE (ARTMIZ) …YOU WON A GORGOUS GLASS TURKISH EYE PENDANT!!! “A strong element of many cultures, Evil eye jewelry is primarily found in the Mediterranean and the Middle East. According to the belief, these reflect or absorb the envy of others, thus eliminating ‘evil eye’ effects such as bad luck. 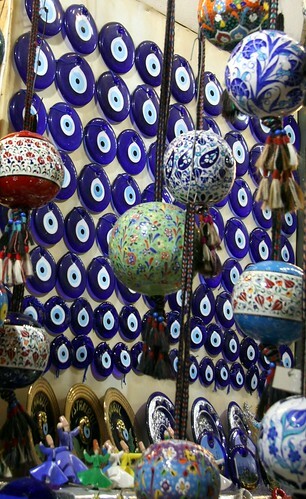 The perception of the Turkish evil eye is common with other cultures but more interestingly, even though the evil eye belief dates back for thousands of years, the Greek Orthodox Christian Church does not dispatch the concept. Yummy…this guy was making hard candy over this hot cauldron. He was lifting a string of molten goo as we walked by. Then it went over shaved ice to instantly harden the candy. We were being hounded by a carpet salesman as we walked to the mosque so I didn’t get to stop and buy some….and I regret it!!! Here’s another beautiful shot from the underground aqueduct I loved so much. I could have stayed down there all day. It was such a break from the heat and the history absolutely enveloped you!!! Are these windows yummy or what???? AND BELOW, A COUPLE OF BRAND NEW CHOW ITEMS IN MY ZAZZLE STORE!!! Congrats Kathe! Hope enjoy it, you’ll have to let us know what you make out of it! That carpet is gorgeous and the windows on that one home were so cute! By the way what is the purpose of those large ornamental balls or are they just everyday decorations there? Hi Vonnie! Those ornaments are hung from the ceilings in a lot of homes, hotels , cafes. I think they are just ornamental and are solid hand made enameled cloisonne. I wanted to bring one home sooooooooo bad. Just too heavy to carry or ship. Arent they pretty? OMG…….I won???? I won an evil EYE pendant???? I am thrilled beyond belief cuz i had my EYE on one of those since you showed them!!! They are gorgeous and I have always loved Cobalt ….i have so many cobalt glass items and artglass so this is something that is definitely “me”!!!! its so cool how these items are matching up so well with the winners!!!! its eerie and wonderful!!! thank you so much, not just for my winning, but for being able to share all the beauty of this holiday with you and steve and the caravan of kids! ohhh,,, so pretty Kathleen… yes, please do show us what you make with it! It’s nice to come back and see all the new photos you’re putting up Sandra…. I can’t believe all the energy you have… I think I’d still be on the couch recuperating from the trip, LOL!! Hey Kathe and HFF!! OMG Kathe I’m sooooooooo glad you are going to appreciate this pendant!!!! It’s so pretty with lots of great Karma attached to it!!!! How cool you love cobalt blue so much…its very bizarre how these drawing items are matching up so well with their recipients. Its soooooo random. Each blog post during our trip has a number that corresponds , then I use a random number picker on the internet to choose the winner!! I’ll be getting all 3 of the items out this coming week. I’ve been waiting for a delivery of padded envelopes to ship in . I ran out thinking I had more in my studio stash! The photos are absolutely great. Great way of capturing many shots. How long were you in Turkey for? Hi Everyone, I must say this…it really IS eerie how each item went to a person who really wanted it or appreciated it for everything it is. Ah the magic of Halloween, we all got treats! Thank You again Sandra, it was great of you think about us and to pick these items up and take the time to do these drawings for all of us who traveled along with you. I know I speak for all of us when I say WE APPRECIATE YOU! Hello Leyla and Vonnie!! ,……..Leyla we were in Turkey for only one week with Egypt and France flanking our Istanbul stay. We are ready to go back for a solid 2 weeks in Turkey next time.. What an incredible place. Vonnie what a sweet thing to say!! I’m so touched by all of you and your comments during and after our journey. It is MY ABSOLUTE PLEASURE to bring back some treasures for our loyal armchair tourists!! You are a very important part of the memories of our journey!!! I would like to know if you can get or you saw Starbucks Ankara, Istanbul and Izmir mugs in just one Starbucks store there or at the airport? Do you know how much each mug cost and Turkey tumbler cost?